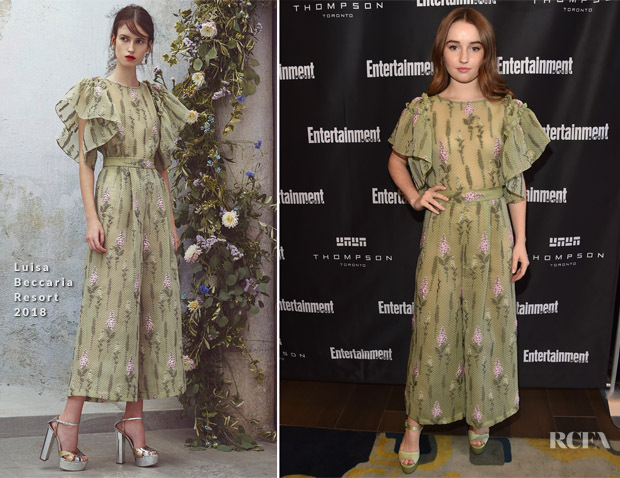 Kaitlyn Dever was one of the lovely ladies at the Toronto International Film Festival, attending Entertainment Weekly’s Must List Party on Saturday (September 9). I must say that this Luisa Beccaria Resort 2018 jumpsuit is a must-try. The moss green ensemble enhanced her skin tone and hair. Plus, it had a soft elegance. Flecked with floral appliqués and accented by ruffle sleeves, the jumpsuit offered a fresh take on ethereal ensembles and provided relief from the onslaught of sheer dresses. This makes me excited to see what the young actress has in store for us on future red carpets. Kurt Geiger shoes completed her look.